First up, I talk to Niki Koh, Audio-Visual Associate. Dressed in a T-shirt and sneakers and with long, wavy hair pulled into a bun, Niki exudes a chill vibe. He is currently doing a BA in Communication Design at RMIT University in Singapore, and plays the drums for the local band, Forests. They are going on tour in Malaysia in December. A jack-of-all-trades, Niki manages the Fab Lab, Practice Room 5 (the band room), and miscellaneous work around the school. For instance, he helped to set up the Halloween haunted house. “It’s exciting because I never know what will happen. Every day is different,” he says of his daily routine. 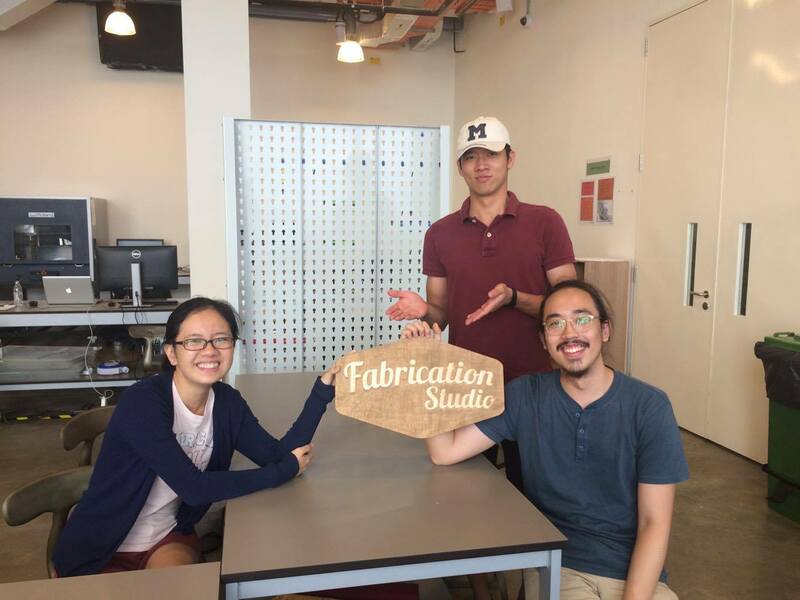 The Fab Lab contains tools and machines, including a 3D printer. Currently open Tuesdays and Thursdays from 4-10pm, student associates there can teach interested people how to use the machines. “Treat this place like an open library. Try the machines; come in and get inspired,” Niki says. Don’t forget to wear covered shoes, though – I was initially denied entry due to my flip-flopped feet. Next, I speak with Nabila Abu Talib, Executive of Arts Programmes. Elegantly dressed and personable, Nabila requests that we sit at the amphitheater to get some fresh air. A cosmopolitan individual, Nabila has studied and practiced theater in the UK, India, and South Africa. Outside of Yale-NUS, she is involved in Yellow Chair Productions, a community theater group based in Tampines that works with youths. Nabila is the “gatekeeper” of the West Core spaces: the practice rooms, Black Box Theater, and Performance Hall.Venue bookings go through her. She also offers student groups guidance on stagecraft and creative direction. “What is their vision? What are they expecting? Why do they want to do this?” Nabila will ask aspiring student productions. “We want them to be a thinking production team.” She enjoys the time she spends with students, watching them grow and develop in their skills. Yet she also cautions me not to forget staff who are less well-known. Two such unsung heroes are Md Shafei Seri, Technical Manager, and Md Farhan Bin Abu Bakar, Staging Manager, who both helped to conduct Szu Jin’s lighting workshop. Bluff, hearty, and affable, they generously offer me a cup of coffee in the Arts pantry. Shafei is a grizzled veteran with years of experience under his belt; Farhan is younger and has a quick, ringing laugh. Although Shafei is Farhan’s boss, the two men share a warm mutual respect. 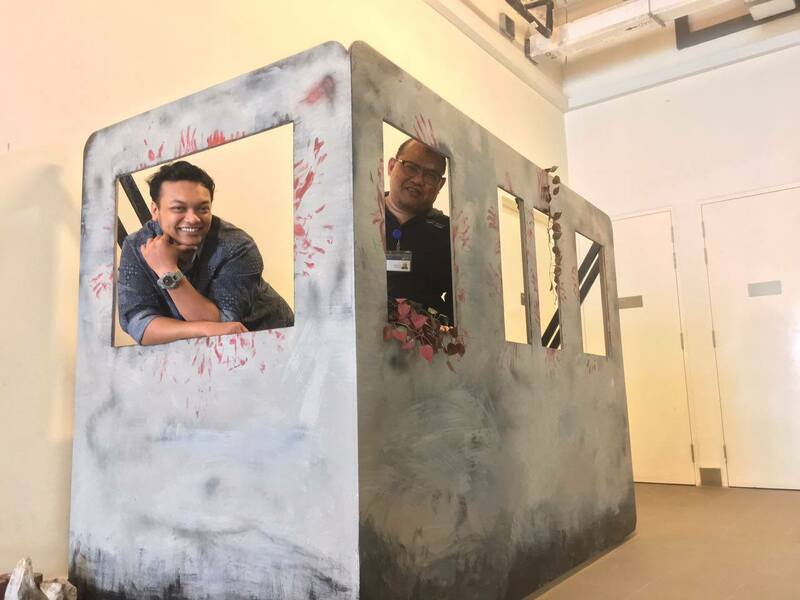 Farhan (left) and Shafei (right) in the model train built for Green Room Theatre. In his time off, Farhan enjoys fishing, and sometimes rents a boat and goes out to sea. He once caught a grouper weighing 10 kg. Shafei is more of a family man; he takes his four children on trips to Malaysia during the school holidays. He is also involved in Teater Kami, a Malay theater group. Having written the technical specifications for the newly renovated Victoria Theatre, Shafei is quite the legend in the local drama scene. My final interview is with the Associate Director of Arts and Media, Gurjeet Singh. I am struck by the number of his books. Gurjeet is clearly a bibliophile with an eclectic palate: his shelves contain works on music and film, histories of the Crusades and the Second World War, and even The Landmark Herodotus. Gurjeet describes himself as “really a history buff”. Urbane and soft-spoken, Gurjeet quickly puts me at ease. A proud alumnus of Anglo-Chinese School, he studied psychology and literature at NUS and has a long history in Singapore’s arts scene. He worked in the Arts Council, Victoria Theatre (where he met Shafei), Republic Polytechnic, and even helped supervise construction of the Star Theatre in Star Vista. 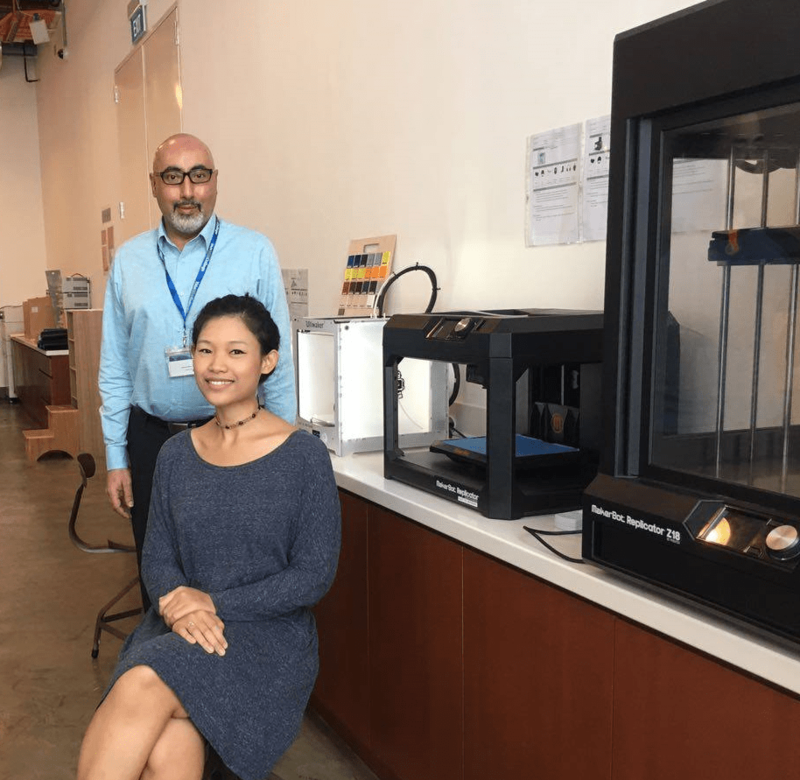 Gurjeet and Nabila in the Fab Lab. While a large part of his job involves running the department, Gurjeet sees the primary mission of A&M as helping students to develop their individual voices. He and his team work alongside students to clarify, polish, and articulate the latter’s creative ideas as collaborators, not overseers. “The students drive, Arts and Media facilitates, supporting their vision,” he says.